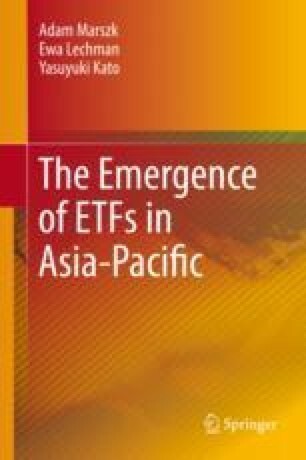 This chapter comprises results of the empirical analysis of ETFs markets in the Asia-Pacific region. It provides an overview of the current state of development of ETFs markets in 12 countries. First, it presents and compares their level of development and provides short characteristics, including their structures and features of the key categories of ETFs used in various countries. Moreover, it describes the main trends of the Asia-Pacific regional ETFs market in terms of turnover (and number of listed funds), supplemented by the analysis of the inequalities concerning diffusion of ETFs in the region. Second, this chapter demonstrates the results regarding ETFs diffusion, i.e., ETFs market development that is considered in two perspectives: as the value of turnover of ETFs on the local exchanges (absolute approach) or as the share of ETFs in the total turnover of index instruments (relative approach). The analysis is conducted using the models of diffusion of innovation. The final part of the chapter is devoted to discussion of projections of the diffusion of ETFs in the Asia-Pacific region. Calculations are based on monthly data for the years 2004–2017. Business Standard. (2017). How India’s ETF market became the second fastest growing in the world. Retrieved July 30, 2018, from https://www.business-standard.com/article/markets/how-india-s-etf-market-became-the-second-fastest-growing-in-the-world-117030900426_1.html. Carson, R. (2017). Australia loves ETFs – But not as much as the U.S. and Europe. Retrieved August 03, 2018, from https://www.bloomberg.com/news/articles/2017-11-13/australia-boasts-39-etf-market-boom-but-still-lags-u-s-europe. Enemuwe, N. R. (2015). Dynamic ETF pairs trading system. Evidence from Australia. Retrieved July 02, 2018 https://papers.ssrn.com/sol3/papers.cfm?abstract_id=2662258. ETF Trends. (2015). The facts on China’s June correction. Retrieved July 12, 2018, from https://www.etftrends.com/2015/07/the-facts-on-chinas-june-correction/. Ghosh, K. (2017). Have you heard of passive investing? ETF Market in India doubles AUM in 2017. Retrieved August 2, 2018, from https://www.moneycontrol.com/news/business/markets/have-you-heard-of-passive-investing-etf-market-in-india-doubles-aum-in-2017-2464669.html. Ghosh, K. (2018). A growing ETF market in India. Retrieved August 2, 2018, from https://seekingalpha.com/article/4136386-growing-etf-market-india. Lee, M. J., & Hasegawa, T. (2018). The Bank of Japan steps up with record buys of local stocks. Retrieved July 12, 2018, from https://www.bloomberg.com/news/articles/2018-04-03/the-tokyo-whale-steps-up-with-record-purchases-of-japan-s-stocks. Lee, M. J., & Urabe, E. (2017). Bank of Japan’s $150 Billion ETF binge looks likely to slow next year. Retrieved July 12, 2018, from https://www.bloomberg.com/news/articles/2017-12-10/the-tokyo-whale-s-150-billion-etf-binge-seen-slowing-next-year. Lystra, M. (2017). China’s share class mosaic. Retrieved July 18, 2018, from http://www.ftserussell.com/blog/chinas-share-class-mosaic. Nangle, T., & Yates, A. (2017). Quantifying the effect of the Bank of Japan’s equity purchases. Retrieved July 02, 2018, from https://voxeu.org/article/quantifying-effect-bank-japan-s-equity-purchases. Pash, C. (2018). The best, and worst, performing Australian ETFs for 2018. Retrieved August 24, 2018, from https://www.businessinsider.com.au/best-and-worst-performing-australian-etfs-for-2018-2018-6. PwC. (2015). ETF 2020: Preparing for a new Horizon. Retrieved February 15, 2018, from https://www.pwc.com/jg/en/publications/etf-2020-exchange-traded-funds-pwc.pdf. Rapoza, K. (2015). A timeline of what China’s Gov’t did to save stock market. Retrieved July 22, 2018, from https://www.forbes.com/sites/kenrapoza/2015/07/13/a-timeline-of-what-chinas-govt-did-to-save-stock-market/#7d54b4d02a67. Samalad, R. (2017). Do ETFs have a future in India? Retrieved July 23, 2018, from https://www.morningstar.in/posts/43871/etfs-future-india.aspx. Samsung Asset Management. (2010). Overview of Korean ETF Market. Retrieved March 30, 2016, from www.set.or.th/th/news/download/files/2553/OverviewofKoreanETFMarket.pdf. Shimada, Y. (2018). Bank of Japan shows signs of backpedaling on ETF purchases. Retrieved August 02, 2018, from https://asia.nikkei.com/Economy/Bank-of-Japan-shows-signs-of-backpedaling-on-ETF-purchases. Takeo, Y., Lee, M. J., & Hasegawa, T. (2017). Japan’s Central Bank is distorting the market, Bourse Chief Says. Retrieved July 14, 2018, from https://www.bloomberg.com/news/articles/2017-07-19/japan-bourse-head-turns-surprise-critic-of-kuroda-etf-purchases. The Investor. (2016). KRX to encourage ETFs, ETNs for pension funds. Retrieved June 30, 2018, from http://www.theinvestor.co.kr/view.php?ud=20161013000838. TWSE. (2018). Liquidity provider program. Retrieved August 12, 2018, from http://www.twse.com.tw/en/page/ETF/liquidity.html.